constitutes a collection of studies that reflect and contribute to the growing scholarly interest in manuscripts as artifacts and witnesses to early stages in Jewish and Christian understanding of sacred scripture. Scholars and textual critics have in recent years rightly recognized the contribution that ancient manuscripts make to our understanding of the development of canon in its broadest and most inclusive sense. The studies included in this volume shed significant light on the most important questions touching the emergence of canon consciousness and written communication in the early centuries of the Christian church. The concern here is not in recovering a theoretical "original text" or early "recognized canon," but in analysis of and appreciation for texts as they actually circulated and were preserved through time. Some of the essays in this collection explore the interface between canon as theological concept, on the one hand, and canon as reflected in the physical/artifactual evidence, on the other. Other essays explore what the artifacts tell us about life and belief in early communities of faith. Still other studies investigate the visual dimension and artistic expressions of faith, including theology and biblical interpretation communicated through the medium of art and icon in manuscripts. The volume also includes scientific studies concerned with the physical properties of particular manuscripts. These studies will stimulate new discussion in this important area of research and will point students and scholars in new directions for future work. Scholarly interest in intertextuality remains as keen as ever. Armed with new questions, interpreters seek to understand better the function of older scripture in later scripture. The essays assembled in the present collection address these questions. These essays treat pre-Christian texts, as well as Christian texts, that make use of older sacred tradition. They analyze the respective uses of scripture in diverse Jewish and Christian traditions. Some of these studies are concerned with discreet bodies of writings, such as the Dead Sea Scrolls, while others are concerned with versions of scriptures, such as the Hebrew or Old Greek, and text critical issues. Other studies are concerned with how scripture is interpreted as part of apocalyptic and eschatology. Early Christian Literature and Intertextuality includes essays that explore the use of Old Testament scripture in the Gospels and Acts. Other studies examine the apostle Paul's interpretation of scripture in his letters, while other studies look at non-Pauline writings and their utilization of scripture. Some of the studies in this collection show how older scripture clarifies important points of teaching or resolves social conflict. Law, conversion, anthropology, paradise, and Messianism are among the themes treated in these studies, themes rooted in important ways in older sacred tradition. The collection concludes with studies on two important Christian interpreters, Syriac-speaking Aphrahat in the east and Latin-speaking Augustine in the west. Scholarly interest in intertextuality remains as keen as ever. Armed with new questions, interpreters seek to improve their understanding of the function of older scripture in later scripture. The essays assembled in the present collection address these questions. These essays treat pre-Christian texts, as well as Christian texts, that make use of older sacred tradition. They analyze the respective uses of scripture in diverse Jewish and Christian traditions. Some of these studies are concerned with discreet bodies of writings, such as the Dead Sea Scrolls, while others are concerned with versions of scriptures, such as the Hebrew or Old Greek, and text critical issues. Other studies are concerned with how scripture is interpreted as part of apocalyptic and eschatology. 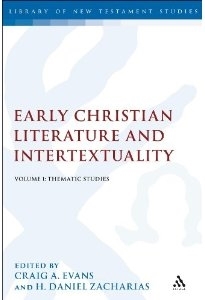 Early Christian Literature and Intertextuality includes essays that explore the use of Old Testament scripture in the Gospels and Acts. Other studies examine the Apostle Paul's interpretation of scripture in his letters, while other studies look at non-Pauline writings and their utilization of scripture. Some of the studies in this collection show how older scripture clarifies important points of teaching or resolves social conflict, law, conversion, anthropology, paradise, and Messianism are among the themes treated in these studies, themes rooted in important ways in older sacred tradition. The collection concludes with studies on two important Christian interpreters, Syriac-speaking Aphrahat in the east and Latin-speaking Augustine in the west. These essays explore new methods and overlooked traditionsthat appear to shed light on how the founders of the Christian movementunderstood the older sacred tradition and sought new and creative ways to letit speak to their own times. Gurtner discusses the Matthean version of the temptation narrative. Chandlerinvestigates the exhortation to 'love your neighbour as yourself' from Lev.19.18b. Talbot re-examines Jesus' offer of rest in Mt. 11.28-30. Myers exploresthe ways Matthew's appeal to Isa. 42.1-4 in Mt. 12.17-21 affects thecharacterization of Jesus in his Gospel. Hamilton explores 1 Enoch 6-11 as aretelling of Genesis 3-6. Herzer seeks to explain varuiys aspects of Mt.27.51b-53. McWhirter explores the citation of Exod 23.20, Mal. 3.1, and Isa. 40.3in Mk 1.2-3. Hopkins investigates the manner in which Jesus engages questionsand persons regarding purity and impurity. Miller notes that victory songs area generally acknowledges category of Hebrew poetry. Gregerman argues thatstudies of early Christian proselytism to Gentiles are largely focussed onmissionary methods of converts. Myers addresses John's use of Moses traditions in his characterization of Jesus. Stewart examines the Johannine use of Ps. 82 by merging a broader contextual examination with an analysis of formal logic. Moyise discusses Paul's quotations adn explores their relevance for the scholarly consensus. Lincicum studies Paul's letters and the Temple Scroll and compares their exegetical practice with references to Deuteronomy. Wells discusses the topic of divine and human agency in Pauline theology and soteriology. Luckensmeyer investigates how Paul wove words, phrases, and themes from Obadiah into his first letter to the Thessalonian Christians. Becker examines 2 Cor. 3.4-18 and Mk 9.2-9. Bucur investigates the peculiar reading of Hab. 3.2. Jobes probes the extent of the influence of the Twelve Minor Prophets on the writers of the New Testament. Matlock examines Solomon's prayer of dedication of the Jerusalem temple. 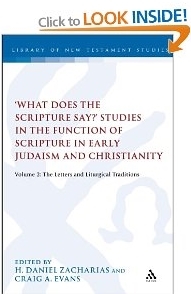 Stern proposes a new model for understanding both the role of biblical texts in early Jewish liturgy and the relationship between biblical and non-biblical utterances in the early synagogue context.